Dutch Masters Cigarillos Atomic Fusion Cigars 60ct - Dutch Masters Cigarillos Fusion Cigars - Dutch Masters Cigarillos Atomic Fusion Cigars - Dutch Masters Cigarillos Berry Fusion Cigars - Dutch Masters Cigarillos Irish Fusion Cigars - Dutch Masters Cigarillos Java Fusion Cigars - Dutch Masters Cigarillos Blend Silver Cigars - Dutch Masters Cigarillos Mint Fusion Cigars - Dutch Masters Cigarillos Rum Fusion Cigars - Dutch Masters Cigarillos Honey Fusion Cigars packed in 23/3's 60 cigars each box. Dutch Masters Cigarillos Atomic Fusion Cigars 60ct have gathered a massive fan following since they were first manufactured in 1911. The natural wrapping and homogenous binder ensure a rich and smooth smoking experience. The Cuban-Seed fillers a which impart a royal flavor to these stogies and make them apt for after-dinner smokes. Dutch Masters Cigarillos Atomic Fusion Cigars 60ct binder is also encompassed with a natural Connecticut wrapper, which helps maintain smoothness in the cigar's texture. They are available in units of 20/3's - 60 Cigars fresh foil packs of 20. 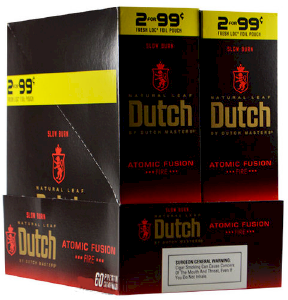 Dutch Masters Cigarillos Atomic Fusion Cigars 60ct come in many flavors and in pure tobacco smoke varieties. They are made of Caribbean basin Cuban-seed tobacco blends. Dutch Masters Cigarillos Atomic Fusion Cigars 60ct filler and binder are then enclosed using natural tobacco leaf wrappers. The Dutch Masters Cigarillos Fusion Cigars are flavored cigars with rich unflavored tobacco varieties Dutch Masters Cigarillos Fusion Cigars - Dutch Masters Cigarillos Atomic Fusion Cigars - Dutch Masters Cigarillos Berry Fusion Cigars - Dutch Masters Cigarillos Irish Fusion Cigars - Dutch Masters Cigarillos Java Fusion Cigars - Dutch Masters Cigarillos Blend Silver Cigars - Dutch Masters Cigarillos Mint Fusion Cigars - Dutch Masters Cigarillos Rum Fusion Cigars - Dutch Masters Cigarillos Honey Fusion Cigars packed in 23/3's 60 cigars each box.